The annual Family History month in New Zealand is August. But genealogists know that every month is family history month. It’s the thrill of the chase of finding an ancestor living, working and playing. What a bonus if they wrote a Will, or a letter to the Editor, or went to Court. From photos we see our great greats looking sternly at us, perfectly groomed and not a hair out of place. But having a photo taken was a great event. How did great grandmother survive doing all the washing by hand? Then down on her knees scrubbing the floor and keeping the coal range clean? Singing as she did it. My grandma would not have a steam iron. “Who needs those new fangled things? This one works perfectly.” I say the same to my grandchildren today when they think I need a new computer, TV or telephone. To proofread small photo books on Cambridge people who have written about Cambridge history or have left their mark in the Cambridge Museum. Sunday 17 June 2012 at 3pm Cambridge Museum, Victoria Street, Cambridge. I have been involved with researching family history and Cambridge heritage for over 25 years. The thrill of the chase is the motivation, then to be able to record a synopsis of my results is the gratification. Recording today’s history (changes that catch my eye) through photographs is just something I enjoy doing. 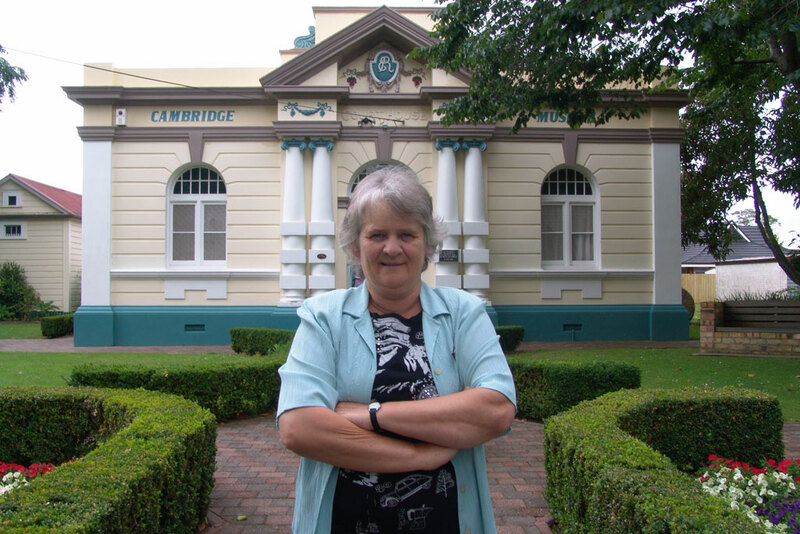 From 1992 – 2013 I was employed as the fulltime Curator of the Cambridge Museum. The Cambridge Historical Society Inc own the collection and the Waipa District Council now administer the staff and museum. I am now retired. The Duke is my daughter’s dog, a large Mastif x Labrador. Along with four grand children I am regularly called on to babysit the very rambunctious Duke.